Bob married Norma Schwabauer in 1948, graduated from the University of Wisconsin in 1951 and then moved to Colorado. He started his insurance career with O’Rourke and Daniels in Denver and with his wife raised four children, Rob, Lindy, Randy and Lisa, in suburban Cherry Hills Village. 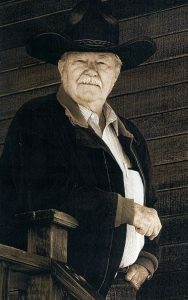 He founded The High Country Corporation in 1955 and sold out in 1979. Cattle ranching became his second career. He raised Texas Longhorns and later Red Angus. His Colorado ranch, Prairie Canyon, is now dedicated to wildlife, open land, and western history. Sold to Douglas County Open Space in 2000, his desire was for the ranch to remain undeveloped and open to horse back rides, hikes, picnics and historical tours. In later years, he enjoyed four granddaughters, Staci, Ashley, Summer, Liberty and dear friend Carol Gummersall. In March of 2015, he became a Great Grandfather to Irelyn Shultz Griffin. He had a long and full life and will be missed by his family and friends. A celebration of life event will be held in the summer of 2016, date to be determined. Click here to enjoy a tribute to Bob. I was sorry to hear of your dad’s passing. May he rest in peace.. So wonderful to hear from you! Thank you for your wishes.